Hintonburg’s historic underpinnings as a working-class neighbourhood are getting a modern makeover from the Colizza Bruni Architecture team. Their sixth project in the ‘hood is a six-unit mosaic of silver and black corrugated metal. The materials echo the area’s industrial past, and the design — small and close to the street — pays homage to the neighbouring houses, but with a modern twist. 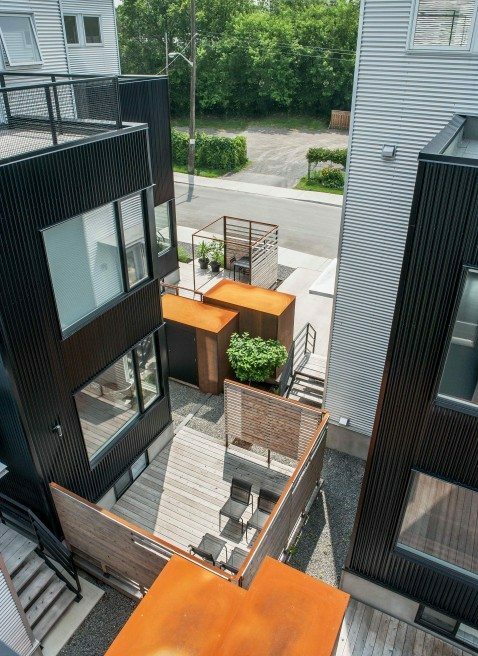 This story originally appeared in Ottawa Magazine’s September 2013 “innovative infill” edition. Order your copy here. Fans of Tetris will be intrigued by how six units — four single-family houses and one front-to-back semi-detached — can all fit onto an irregularly shaped 6,000-square-foot lot (the feat is especially astounding if you consider that the average suburban lot size for just one house is 5,000 square feet). The key to this particular puzzle lies in the creative approach taken by Colizza Bruni Architecture. 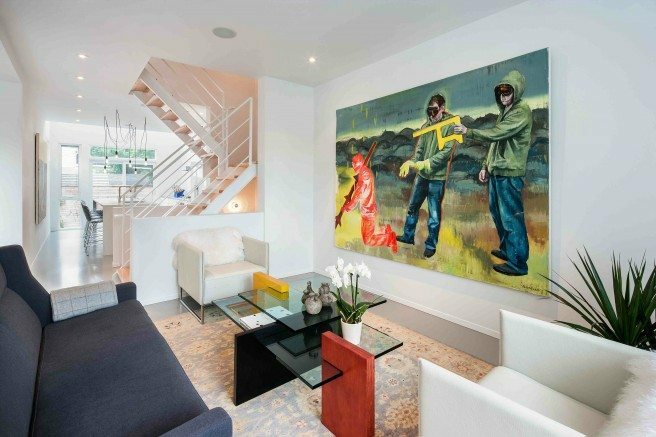 From the choice of lot to the development process, the design to the finishing details, every aspect was carefully considered with an eye to creating livable spaces that fit in with the neighbourhood. The creative journey was launched in 2008 when Jim Colizza bought the property at the corner of Pinhey and Armstrong streets. Because the streets do not meet at a right angle, the lot was skewed — basically an angled rectangle, a parallelogram. Still, Colizza regarded the lot not as a challenge but as an opportunity — a chance to come up with an innovative solution. The resulting six houses were completed in May 2011. Each one yields between 800 and 1,100 square feet of bright, airy space inside, plus innovative outdoor details: sheds, patios, rooftop terraces, and individual parking. Colizza’a colleagues Anthony Bruni and Nic De Socio liked the design so much, they both bought a unit. In fact, the firm ended up pre-selling all six units, allowing the owners to have a hand in the building and design of their respective homes. Hintonburg is rapidly becoming the architecture firm’s preferred neighbourhood for infill. They’ve now completed six projects, including a front-and-back duplex on Grant Street, single-family houses on Gladstone Avenue and on Stonehurst Avenue (Bruni recently moved into that one), plus semi-detached houses on Garland Street and, their latest, on Armstrong Avenue. Their new credo could be that small is not only beautiful, it’s also immensely livable. 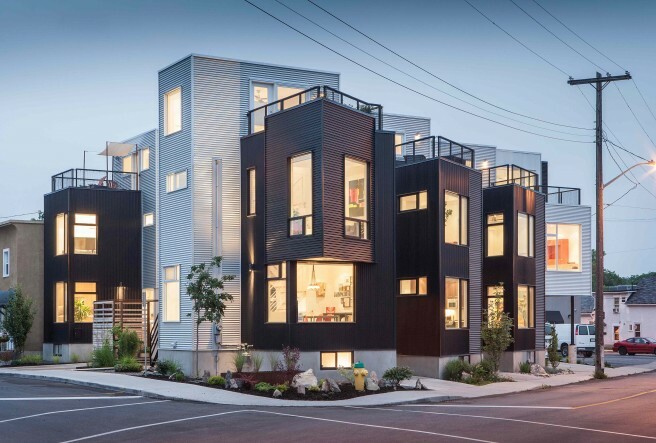 What constitutes a successful infill? Bruni: It feels like a success when an infill fits with the neighbourhood but has its own character. An infill doesn’t have to mimic anything around it — it just has to be inspired by it. Why did you decide to buy this oddly shaped lot? Bruni: That’s usually why we buy a lot. People don’t tend to want the odd-shaped lots, because they’re difficult to develop. We like them because you have to be very creative to make them work. You have all these constraints, but as you start to sculpt your building, you find the site plays a role in how you develop it. You end up with a very interesting building. What was the biggest challenge in creating this infill? Bruni: It was the process of severing the lots and working with the [City of Ottawa’s] committee of adjustment and minor variances. We had to be very creative in that way too. If we had severed this in one shot, it would have come under site-plan control, which has huge consequences in terms of development fees, the amount of engineering required, reports, studies, fees to the city for site-plan control, and so on. If you do three or fewer units, you don’t fall under site-plan control. So we took the lot, severed a portion of it, and went to the committee of adjustment for three houses. We got that approved. And later we went back to the committee to sever the next three lots. The city knew what we were doing — it wasn’t as if we were pulling the wool over anyone’s eyes. We did everything properly, but by doing it this way, we saved each owner $10,000 to $15,000. Colizza: The idea was to see how inexpensively we could build. These houses are small, so there’s a saving in land costs. And then there were savings in the construction process. The owners were involved in cleanup, fences, landscaping, caulking, sanding, and a lot of coordination of trades. Every weekend they were out here. They’re all family and friends. It’s actually a model. If you get six like-minded people together who agree on stuff, there’s significant cost savings in buying together, sweat equity, and managing it yourself. And you learn a lot. What was you firm’s role during the construction? Colizza: We managed the construction process for the owners. We provided advice, coordination of the buildings, making sure trades did what they were supposed to do, dealing with the authorities. For example, Hydro wanted to run their hydro lines right in front of the building, but we convinced them to come in on the sides. Those sorts of things. The ideas are the easy part of it. Maintaining the integrity of the ideas through the process when you’ve got all sorts of different approval authorities and contractors, that’s difficult. You just have to be very firm. How did the neighbours respond to the project? Bruni: We had no opposition. We met with the Hintonburg Community Association and showed them the design, and the reaction was very positive. One of the things they liked is that most developers would have done some sort of apartment building or townhouses on this lot. Generally, the character of the neighbourhood is small single-family houses built with simple materials. So we wanted to stay in that context with a series of small single houses. The modernism [of the design] speaks more of its time, while the scale speaks to the scale of the other houses in the area. You also had to get buy-in from the neighbours for your variances. What did they think of your plans? Bruni: They all had their concerns, which were mostly of a practical nature. Some wondered what was going to happen during construction. And some wondered about light and shadowing. We did a sun study to show them what impact there would be. We tried to make it so that the construction would have as minimal an impact on their lives as possible. Generally, the neighbours were great. De Socio: And now we all get along with the neighbours. There’s a whole social dimension. Why did you divide this property into six lots? Bruni: It’s a process as you start to design. It’s appropriate [for this neighbourhood] to do singles, so that’s where it started. Then Jim (Colizza) came up with this “stair tower” with spaces branching off. Next, we looked at how to integrate them into the site. Design is not a linear process — it’s back and forth. We had several different approaches. But it ended up that this worked. Six. It had to work financially too. Why four singles and one semi-detached? Bruni: The site has a little bump-out in the back [northeast] corner, so that lot was larger than the others. We thought of doing one bigger house but ended up doing a front-back semi-detached. Why is the staircase in the centre? Colizza: It’s all about circulation space. If the stair is at one end, you have to have a hallway somewhere. So your bedroom is 11 feet wide, minus three feet for the hall — you end up with a seven-foot-wide bedroom. 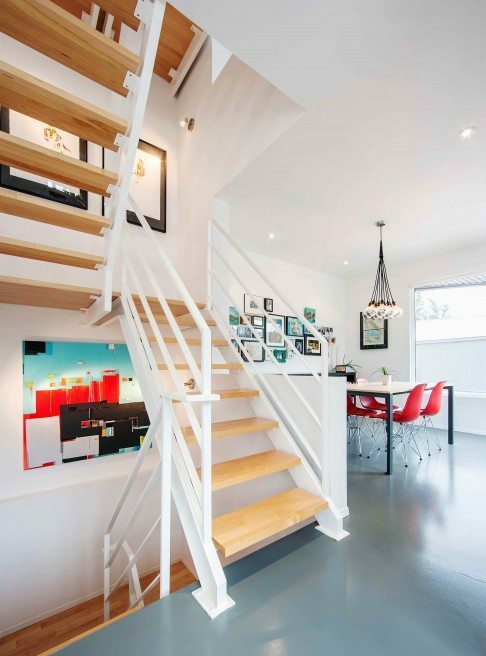 A central staircase gives you the most efficient floor plan. De Socio: In a small space, you have to minimize circulation space. With 1,000 square feet, there could have been 300 square feet just in hallways. Colizza: Another advantage of having the staircase in the centre is that we’re able to enter off the side of the house, not the front, which also saves space. Do the building materials also fit with the character of the neighbourhood? Bruni: The materiality was inspired by the context. This isn’t the Glebe, where it’s all old brick. These houses are aluminum siding, some are wood, and there are industrial buildings scattered here and there. One of the things we love about this neighbourhood is how it gave us our inspiration for these materials.Both Jim [Colizza] and I are from Sault Ste. Marie. It’s an industrial town, and in almost any view of the city, the steel plant is what you see. Some people think it’s an eyesore, but I think the metal buildings and the collage of materials is something beautiful. I’m inspired by industrial materials — I have a personal connection. Some people think it’s cold, but for me, it’s very real, very honest. How do these residential units differ from others you’ve designed? Bruni: These houses are unique — they’re designed for Pinhey and Armstrong. Colizza: When you stand back, it’s a mosaic — black windows and Galvalume, wood fencing, and a bit of orange with the shed. Six buildings that had to exist as one, so the parts are in the whole. What were the aesthetic objectives in the architectural expression? Colizza: From an organizational point of view, there are the central stairs and a room on each side of the stairs. The stairs go all the way up and end at a little room up there. That’s the map — the basic organization. We created a shell so that everyone could be creative and inhabit it how they wanted. Every owner had the ability to rearrange the rooms within the shell. Some have the master bedroom at the back, kitchen at the front. Or the other way around. One of the owners moved the exterior wall back to create a double height in the kitchen. What specific elements did you know you wanted? What were the must-haves? Bruni: You need a place to cook, a place to sleep, a bathroom, and some outdoor spaces and outdoor storage. When you do a 1,000-square-foot house, you’re really stripping the program down. You can’t have the great room, you can’t have the library, and you can’t have a powder room. Colizza: We fight powder rooms all the time. In really tight spaces, they’re an imposition on the living space. You don’t want a powder room off the kitchen or dining room. You’re cooking, and you hear a toilet flushing. When you design infills, you have to be conscious of how space is used. Were there elements you wish you could have included? De Socio: I’m pretty happy. I have my studio [for painting] and outdoor space. I think everyone is happy with what they have. The design accommodates all our unique needs. Colizza: The owners found ways to be creative and make it work. Furniture is a big thing. You can’t have big, bulky furniture. You have to rethink things when your house is 11 feet wide. Nic De Socio, you’re living in one of the houses. What do you find works really well? De Socio: The scale works well for us. There are two of us here. We don’t have kids. Yet. We like the openness of everything. No room is closed off to another. And the radiant heat is amazing. Anyone who comes over, it’s the first thing they comment on. What do you find works less well? De Socio: Hmmm, that’s difficult. I’m not really happy with the floor covering [a mix of concrete and gypsum]. It’s epoxy. It looks great, but it’s not as durable as we’d like. Bruni: I dropped my screwdriver, and it chipped the floor. It’s almost like a painted surface, so it’s white underneath. You could lay tile or cork over it. I’d opt for something more durable next time. Do the units have any green aspects? De Socio: The [gas-fueled radiant in-floor] heating doesn’t cost very much at all. And we have a tankless water heater for both the heating and all the domestic hot water. Colizza: We have really good insulation too. And part of the design, with the central tower, is to cool the places naturally. All the windows at the top [of the stairs] can be opened, so you get a chimney effect — the heat comes up through the central stair and then out the windows at the top. And you’re not heating and cooling a huge space. People have a 2,700-square-foot house with all these energy-efficient features to it, but the point is, they don’t need 2,700 square feet in the first place. You can be as efficient as you want, but if you’re heating space you don’t need, you’re wasting energy. Maximizing the lot, the high density in an urban area, in an existing neighbourhood, with existing infrastructure — all those things also have huge environmental benefits. You’re not clearing land. You’re not creating roads. By the nature of the design, it’s environmentally friendly. Your credo on your website states: “Architecture begins with the imagination, is influenced and given form by its place and is realized through craftsmanship.” Did this design begin with imagination, or was it more rooted in place? Colizza: I don’t think you can separate the two. You have to start with a dream, start with asking “What if?” And then that is informed by the context of the neighbourhood. The craftsmanship is the execution of it. The trades today are building suburban houses with lots of trim to hide all kinds of stuff. If you don’t have trim, you have to be very conscientious, right from the digging of the hole and the framing. Bruni: You have to go into the project with an open mind, and it’s got to be rooted in the context, the place. You see these suburban-type houses in urban neighbourhoods — those are, to me, preconceived notions placed on a site.